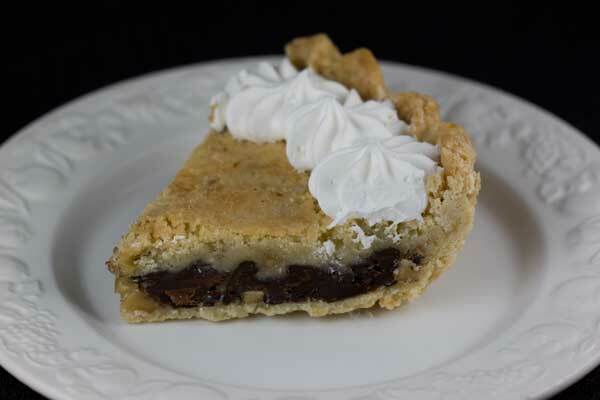 Our neighbors held their annual Kentucky Derby party last weekend, and as usual they served the famous bourbon chocolate walnut pie named after the race. We weren’t able to stick around for dessert, so I made up for it by baking the pie yesterday. If you do a search you’ll see there are many versions of the top secret recipe for the famously trademarked pie. Some versions incorporate one, two or all of the following: brown sugar, brown butter, corn syrup and cornstarch and some even use pecans instead of walnuts. I decided to start with a basic recipe that calls for a fairly common ratio of 1 cup of walnuts, 1 cup of sugar (no brown), 2 eggs, 1/2 cup of melted butter and a little over a cup of chocolate chips. I made it as written, but toasted the nuts and par-baked the pie shell since 40 minutes didn’t seem quite long enough. I’m not positive the par-baking was necessary, but it certainly didn’t hurt. 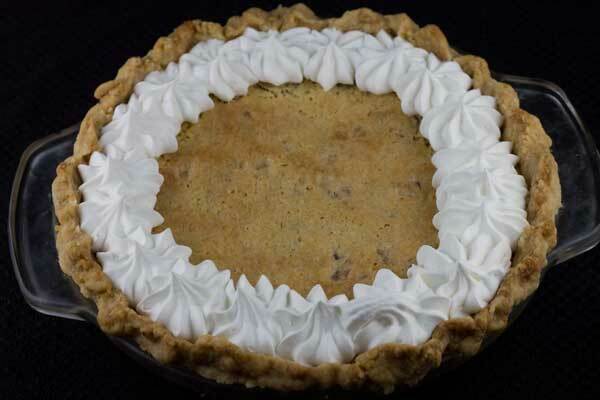 At first I thought the pie might be too much like the popular Toll House Pie, which is not among my favorites, despite the fact I love chocolate chip cookies. That pie, in my opinion, is a little too sweet and gooey. But this pie was delicious and sliced perfectly after being cooled and chilled. Some people might prefer it warm, but I don’t like gooey desserts that ooze all over when sliced, so I let the pie cool, chilled it long enough to solidify the chocolate, cut it, and served it at room temperature. It was similar to the Toll House Pie, but less rich and greasy. And then, of course, there’s the bourbon! It’s not very strong, so you may want to serve a little on the side. I usually serve Blanton’s, but we were out so I tried a brand called Lexington, which was pretty good (and had a cute horse on the front). As for the chocolate, if you chill the pie and eat it right out of the refrigerator it will be like putting your fork in a blondie. Personally, I kind of like that because it make the pie last longer, but I suppose most people will prefer serving the pie at cool room temperature because it’s softer and easier to eat. Finally, I did get around to asking my neighbor what recipe she used and she said the one from allrecipes.com, which if you made 2/3 of would have almost the same proportions as this pie, but with a mix of brown and light sugar and more butter. I may try that one for fun, but I think I liked this one the best because it was less buttery. I also think I’ll skip any versions with brown sugar and brown butter because that almost seems like overkill and I’m tired of browned butter. Thank you for your descriptions and detail…I learn so much from your posts. Anna, I prebaked my crust to for about 8-10 minutes also. For some reason I was worried it would not get done with all of that gooey filling. I didn’t line with foil though or use weight but it turned out perfectly. I know what you mean about the traditional Toll House pie. I hadn’t made one since I was a teenager, and I thought I had liked it way back then. When I baked one for my family last summer, it was too sweet for my sons (who typically love sweets), and I was surprised at how greasy it seemed. This looks like a great alternative!